about to hike the San Diego Trans-County Trail !!! This coming Saturday, January 18th, with a small part of my PCT hiker family and I will attempt to Thru-Hike the newer San Diego Trans-County Trail, (TCT) beginning at the Sultan Sea, and hiking West for 150+ miles to the Pacific Ocean at Torrey Pines in San Diego. "The San Diego Trans-County Trail is roughly 140 miles from the Salton Sea to Torrey Pines beach. A friend and I hiked last year and it was awesome. The route goes from the Salton Sea, following washes west to Borrego Springs. 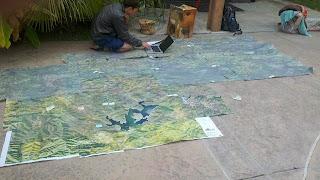 From there, it is the CRHT all the way to Cuyamaca. From there, a road/dirt road walk to cedar creek falls, followed by a bushwhack over El Cajon mt. The next stretch is either a road walk or a bushwhack around San Vicente reservoir. After that, soothe sailing down Peñasquitos Canyon into Torrey Pines marsh and out to the beach." 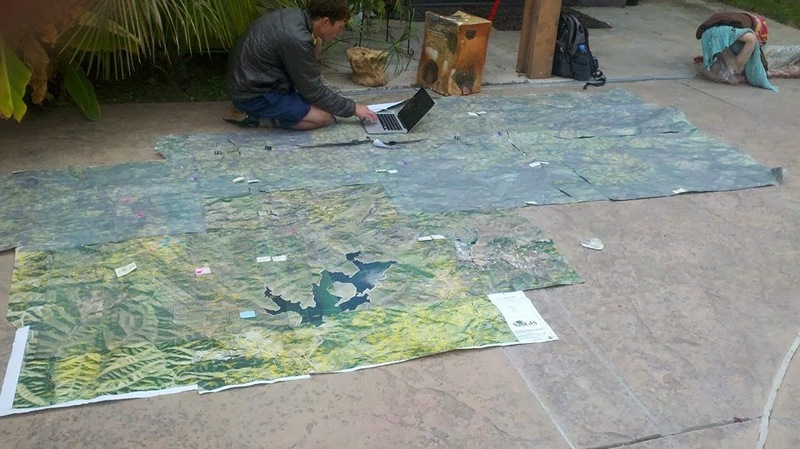 the boys in San Diego establishing a route on some HUGE maps. I am extremely excited to start this!! I am gonna be hiking with a rockstar cast of hikers !! I'll be joining my amazing and inspiring friend, BloodBank (sara fry) whom I finished the PCT with and traveled to Alaska for a summer's worth of hiking and volunteer trail work. Also, rounding out the cast is ScrubRat and his better-half, DoeEyes, who live in San Diego and are responsible for making this trip happen, determining the route, and all logistics. Another amazing hiker joining us is John CACTUS mckinney, and kyle NOTSOBAD dahl. All of us are alumni of the 2012 Pacific Crest Trail. We all hiked with each other or at least crossed paths several times during that epic summer, and I truly can not wait to hit the trail with them again!!! So, since the spring of 2012, I have given away, donated, and sold most of the possessions that I owned. I've changed my lifestyle, and routine, picked up a few good habits, while also dropping and gaining a few bad ones. I have a much better existential awareness now and am slightly more conscious of my place and effect in this universe. I am fortunate to have been shown some of the tools and learned lots of lessons over the last couple years that I may not have been open to in my life before. Thank you all for continuing to follow me. You all inspire me to keep living this non-typical, off-the-beaten-path lifestyle for the time being. 2014 is gonna be a great one. I hope it has already started out well for every single one of you !! !